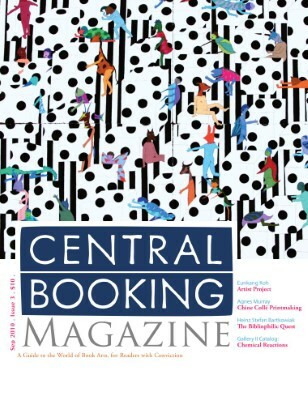 CENTRAL BOOKING Magazine, like its parent gallery, provides a 360 degree view of artist’s books and their integration into the larger art world. In the current issue, Eunkang Koh discusses the philosophies behind her work and how she approaches her own animal-ness in the creation of her art. Agnes Murray provides an advanced instructional on the delicate technique of chine colle printing and Heinz Stefan Bartkowiak describes his decade-long dedication to the art of the book. Also appearing is the latest installment of the graphic/text collaborations of Omar Olivera and Jessica Elsaesser. September’s catalog insert takes a closer look at the current Gallery II exhibition Chemical Reactions, and includes images and articles by History Professor and scholar Dr. Kevin Dann; artist and Doctor of Biochemistry, Lizzie Burns, and daughter of renowned scientific illustrator Irving Geis, Sandy Geis, on the intersections between chemistry and art in a historical and creative context.